This page brings together all the SLENZ -related publications, conference presentations and talks that team members have been producing or have been involved in. Clicking on the links below will either bring you either to the resource itself (e.g. a .pdf, a SlideShare presentation, a video) or to a google doc listing future intentions. SLENZ Literature Review Salt, B,. 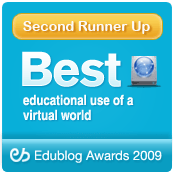 Atkins, C. and Blackall, L. (2008) Engaging with Second Life: Real Education in a virtual world. SLENZ Final Evaluation Report Winter, M. (2010) Second Life Education in New Zealand: Evaluation Research Final Report. Future Plans – Slenz project team members intentions.